“Ljubljana” doesn’t exactly roll off the English-speaking tongue — that’s just about the only reason we can come up with for why the travel press hasn’t been singing its praises for years. The Slovenian capital is a deeply charming city, a picturesque jumble of historic architecture, public squares, sidewalk cafes and ambitious new museums, with a music scene as rich as those of cities many times its size. Set at the center of it all, in a pedestrian-only neighborhood that’s been settled since at least ancient Roman times, is the Vander Urbani, a boldly designed boutique hotel spread across four adjoining townhouses. The contrast between the outside and inside could hardly be greater — a set of traditional Slovenian façades hides a high-design world of glass and chrome and concrete. If it sounds a bit hard-edged, know that the rooms are softened up considerably by Frette linens and robes, Molton Brown bath products and the sorts of armchairs you’ll want to sink into forever. Where it all really comes together, though, is on the rooftop terrace. There some contemporary ornaments — an infinity-edged plunge pool, a glass-walled yoga studio — combine with views of the surrounding tiled rooftops and the street life below. 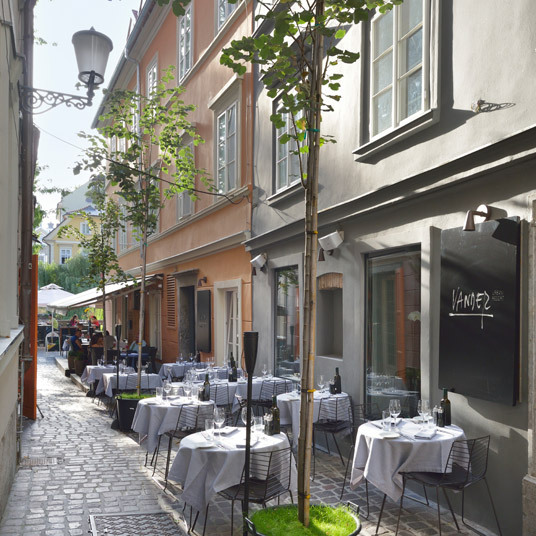 Ljubljana does knows a bit about street life, too, with a population prone to strolling the streets and lingering at sidewalk cafés when the weather is good. Also down at street level is the hotel’s own restaurant, helmed by a French chef who’s apparently been rather swayed by the local culinary tradition and agricultural bounty. The wine, too, is mostly local, Slovenian wines being yet another pleasant surprise to those of us only now getting to know the place — and the owner being something of a wine geek.